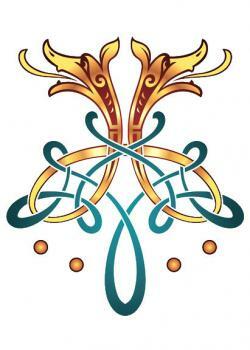 Your Irish heritage or your love for Celtic knot design could inspire you to choose a Celtic dog for your next tattoo. Whether a solitary symbol or woven into an elaborate full sleeve, you get more than a friendly mutt with this highly stylized ink. Celtic history contains a treasure trove of dog stories, real and magical. The mythical race of supernatural heroes in Irish mythology, the Tuatha de Danann, revered their hounds so highly they fought wars over them. Celtic dogs are deeply symbolic, endowed with courage, honor, loyalty, and an ability to travel between worlds as shapeshifters. A dog tattoo connects you to Celtic tradition and a sacred emblem of Irish culture. 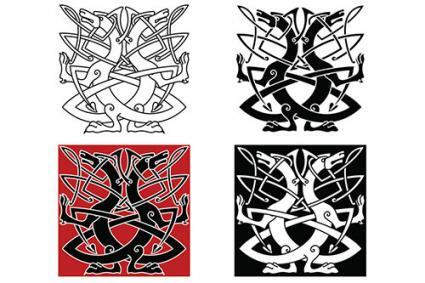 Common Celtic dog designs feature a pair of hounds, intertwined in an elaborate knot pattern. Hounds were essential for Celtic hunting and herding. A wolfhound or a sighthound was a valued asset and companion. Multiple dogs signified a prosperous owner. 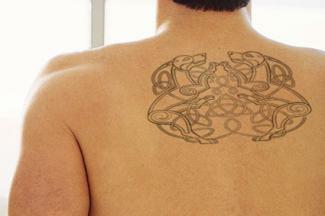 Celtic design is very symmetrical, so doubling the dogs on your skin ensures a balanced tattoo. A two-dog tat means both luck and love because dogs are considered both trusted allies and harbingers of good fortune. Your double-dog tat could encompass your upper back, tattooed across both shoulder blades. Dedicate an entire thigh or forearm to double canine glory. Or center that good luck pair in a more compact tat on your lower back. A man and his hound were a hunting unit, bonded and dependent on one another for survival. A faithful dog could heal your heart with its unconditional attention and love. Dogs were considered magical healers and kept as familiars by gods, goddesses, and healers of both genders. The most famous dog in Celtic mythology was a legendary hero with the noble spirit of a hound. Celebrate a strong friendship, a noble spirit, your favorite mutt, or recovery from hardship with a magnificent, inked-on single dog. A long, lean, sinuous dog with a Celtic knot for a tail might be placed on a foot, shoulder, forearm, or the back of the neck, or serve as the centerpiece of an elaborate Celtic knot work design that takes many sessions and covers a large expanse of skin. The Celts did not leave written records, but they created and passed down richly detailed symbols in their complex knot designs. The art technique is thousands of years old, its origins lost in history, but the Celts get full credit for perfecting the form. Each pattern has a specific meaning. When incorporated in a dog tattoo, the association can amplify the hound characteristics or add a symbolic overlay. Customize your dog tat with a symbolic knot design to create powerful personal meaning. Then display it on your upper arm, the chest just below the neck, or on the back of your neck. Try a Trinity knot - three connected half-circles that form a flower shape to honor the Christian Trinity. Spirals are double or triple whorls that mean infinity. A Shield knot is a circle divided into four equal quadrants of connected strands and is an ancient symbol of protection. 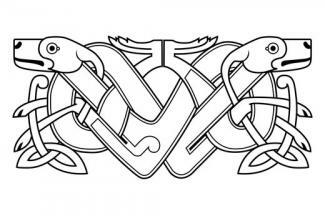 The knot work in your dog tattoo is what makes it distinctly Celtic. The Claddagh is a design based on an ancient Scottish tale of enduring love. It is typically rendered as a ring with two hands holding or forming a heart under a crown. The trinity of meanings is friendship, love, loyalty. A tattoo that weaves the long thin shapes of the Irish hound into the design of the Claddagh powerfully conjures love and loyalty. 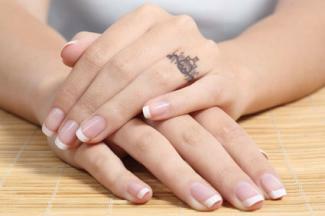 If it's inked on the ring finger of your left hand with the heart pointing towards you, it is a wedding ring. "Cu" means "hound" in the Celtic language, and Cuchulainn is one of the greatest heroes of Irish mythology. When the young and powerful son of the god Lugh kills the smith Culann's prized guard dog in self defense, the boy is overcome with remorse. He promises to act as the smith's guard until he can raise a new hound and is given the name Cuchulainn, or Culann's Hound. Cuchulainn goes on to have many astonishing exploits in love and in battle. A tattoo in the spirit of Cuchulainn stands for strength, faithfulness, dedication, and heroism. A Celtic Cuchulainn dog tattoo might be surrounded by the intricate calligraphy of the medieval monks who illustrated the legend as part of the scriptures they copied. That's a glorious full back that proclaims both your heritage and your heroic aspirations. Treat your Celtic dog tattoo like a typical tribal tat and stick to all black, nearly abstract ink with some fine shading in greys to "pop" the design. That's the serious and somber interpretation. But you can also opt for a riot of color, as wild as the hounds of Irish and Scottish legends. Vivid colored inks, filling in the precise lines of Celtic knotting and the unmistakable head and limbs of the dog, will show off your heavenly hound with a calf, back or chest tat as bright as the sun. However you choose to add man's best friend to your personal ink, a Celtic dog connects you to noble aspirations, ancient power beliefs, and a heritage rich in myth and history.